4D is currently a “S/MBE” certificate holder with the State of CT.
4D design & decorating is an Interior Design Firm with two divisions, Commercial Design and Residential Decorating. The commercial side offers full service Interior Design, Programming, Space Planning, Furniture Packages and Move Coordination. The residential side offers consultation for "design to sell", new home "spruce up" and let's get detailed and decorate / renovate. Double Click Image below to follow the blog. For a great Kitchen Click on older posts! 4D design – Farmington Library’s Maker’s Space- Each “Makers” is different, use a professional designer to plan your space perfectly. 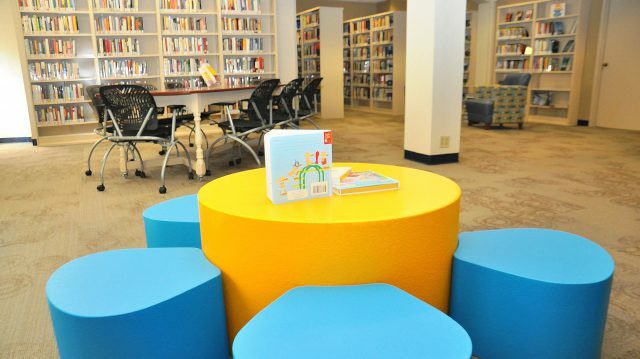 4D design – Norwalk Public Library Children’s Space on hold however the STUDIO ONE (a Maker’s Space) is underway. OPEN-Wallingford Public Library’s Collaboratory (Maker’s Space) has a well planned, creative, techy space that “fits right in” to the WPL culture. Clever Use of Space at the J.P. Webster Library. Art is Everywhere. 4D design – WCSU New – Police Facility Interiors Project – COMPLETE. 4D design – New Britain Public Library -100% Complete and Looking Great with Existing Furniture. Royal Decorative Displays for any Occasion. See our NEW VIDEOS! National Entrepreneurs Day- 4D design featured in Exhibit along with dewright design. Putnam Elementary School- Café with a New Fresh Look and now the Middle School is refreshing it’s Café as well with 4D Design. Candy Cane Building – Board Room Acoustic Project with CCMC. Norfolk Library (CT)- Children’s Room (Library) – Interior Renovation with appreciation for the past. Edith Wheeler Memorial Library -Teen, Snack Lounge and Maker’s Space -One Step Closer. 4D Creates- Craft Workshops and Crafts for Sale. Special Bookings and Off Site Locations Available. Please Inquire. Pre-K – 8: Integrated Day Charter School- IDCS, Norwich Complete. New Headquarters for Consumers Petroleum – Teaming with dewright design. Marino Residence – Canton – teaming with dewright design. 4D & JHA – West Hartford PD – Updates Dispatch Center- Opening Soon. Farmington Library – Main branch, updates “2nd level lounge”. 2 Years installed and still looking and functioning great! What is happening at the L!brary. Blast from the Past for Deanna Dewey!~ American School & University recognizes the CREC-Academy of Aerospace & Engineering School Design Team. 4D design keeps Updated with Furniture and Finishes! Clean, Crisp, Classic and Complete. Mahr -Master Bath. Copyright © 4D design & decorating, llc. 2016. All rights reserved.